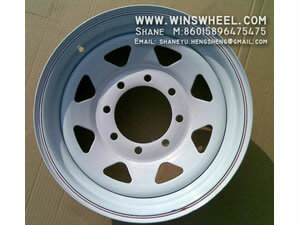 The trailer steel wheel rim, also known as trailer wheel rim, can be used in any kind of trailers including special cars. It is mainly applied in foreign trailer wheel, and in domestic it is not very popular. The size of our trailer steel rim varies from 12''to 16''. According to different needs of our clients, our research and development team have developed the wheel that are certificated by the International Standard Organization. Our method of final treatment: hot-dip galvanizing, line drawing with black and white, and power spraying. This trailer wheel rim is mainly applied in all kinds of trailer, such as yacht trailer, oxen and horse trailer, and special cars. Its loading capacity is 1100-3200 pound. 4. By conducting the product's surface treatment and preliminary treatment, its shelf life and quality are all improved. Wuxi Hengsheng Wheel Co., Ltd is a leading manufacturer of trailer steel rim (trailer wheel rim) in China. Besides trailer steel rim (trailer wheel rim), we still supply clients worldwide with many other types of steel wheel rim, including passenger car wheel rim, tubeless truck wheel rim (demountable truck rim), mobilehome steel wheel rim, pick-up truck wheel rim, custom steel wheel rim (SUV/jeep steel rim), auto wheel rim (steel auto rim), and so on. Featuring unique design and reasonable price, our products have been quite popular among clients from America, Oceania, Middle East and many other countries. Besides, OEM service is also available. If you need trailer steel rim (trailer wheel rim), please contact us freely. Tubeless Truck Wheel RimThe tubeless truck wheel rim, also called demountable truck rim, can fully meet the requirements of normal light trucks.